Webster's simply defines the word as "a severe test." Suffice to say, the Icers face their toughest test of the season this weekend when the #4 Fightin' Blue Hens make the trip north from Delaware. Just how much of "a severe test" UD will be depends on which article you read, what online forum you frequent, or who you talk to. The critics are out there, and I'm the first to admit that I've been critical of the team for not playing up to its potential in this first semester. The periods of brilliant play at both ends of the rink have been overshadowed by mega-lapses that have left everyone, including the players, scratching their heads. The key to success this weekend from my point of view is this - one shift at a time full out, then get ready for the next. It is not about playing the role of a star player; it is about developing the habits needed to become one. Bergeron comes from a program where being great was part of the package. That was part of “the lifestyle.” The lifestyle is the commitment physically, mentally, and emotionally to becoming and staying a great player every shift of every game. "These kids, the young guys, they need to start to be able to look inward when it isn’t going well in games,” Bergeron said. “What we are doing is asking the younger guys, the freshmen and sophomores, to grow up pretty quickly. We are asking them to speed up the process so we can get to where we want to be. The Icers know where they want to be. As both Kevin Miller and Scott Balboni told me, this weekend is their chance to get there. The hockey world is a sadder place this morning following the news yesterday that Pat Burns lost his lengthy battle with cancer. It was not a surprise, but Burns' death is a shock, nonetheless. I suppose the news hit me hard on a number of levels. He was 58, I'm 57 - we are both ex-cops who love hockey. But selfishly, it was because of what he did as the coach of the Maple Leafs in the 90's. The press reports all say Pat won a Stanley Cup with the Devils and coached the Bruins, but for long-suffering Leafs fans, Burns provided us with a two-year thrill ride in the midst of nearly a half-century of mediocrity. I'll never forget the '93 cup run that, had Kerry Fraser had his eyes open, would likely have led to a Toronto - Montreal Stanley Cup final., rather than a King's - Habs meeting. The following season, the Leafs again made it to the Western Conference final, losing to Vancouver. Burns is unique, in that he coach both the Canadiens and Maple Leafs. It is a travesty that he was not inducted into the Hockey Hall of Fame prior to his passing. He is deserving of a place in the Hall alongside the great coaches of the game. It seems fitting that Pat passed away the day before the two teams renew their rivalry tonight at the Bell Center. I've got the DVR set and will be watching as soon as we get home from this afternoon's game. Read Joe Warmington's column in today's Toronto Sun for tributes from former Leafs players. His death has fans of both teams mourning the loss and remembering the good times. A Saturday night tilt between the Leafs and Habs has never been a place where hockey fans can find common ground. But that will change tonight. It’s like it was written in a script. Some things are bigger than a single game and Burns’ death will be on the minds of all fans at the Bell Centre tonight and watching on Hockey Night in Canada. Rest in Peace, Patrick Burns. The Icers put a bakers dozen on the board on Friday night, thumping the Towson Tigers 13-0. Matthew Madrazo won his second game and notched his first career shutout. Paul Daley had his first career hat-trick, while Tim O'Brien, Domenic Morrone and Michael Longo each scored twice. For the sophomore Longo, his first goals as an Icer came 9 seconds apart in the third period. I spoke with Michael after the game. The first half of this 2010-11 season has been a struggle for the Icers and a disappointment for their fans, but sometimes you just have to take a step back and realize that it's just a game. Wednesday was one of those times. Denver University forward Jesse Martin walked into a press conference at the Craig Hospital in Englewood, Colorado just two weeks after breaking his neck in a game at the University of North Dakota. NoDak forward Brad Malone served a one game suspension for the hit, but Martin says he has no hard feelings about the play. Jesse will head home to Edmonton for the DU holiday break. Even though we Canadians celebrate Thanksgiving in October, I think it's a given the Martin family will be giving thanks that Jesse is home and on the road to a full recovery. I caught up with junior forward Paul Daley before Tuesday's practice. "Gunner" said it was a long, quiet bus ride back from Rhode Island, which should come as no surprise following the sweep by the Rams. The Icers will head to Maryland Friday for the first half of a home and home series with the Towson Tigers. Towson has won just twice this season, but the Icers have to be wary of what could be a "trap" game. There's little in the way of positives to take from Rhode Island's sweep of the Icers at the Boss Arena. Marek Polidor's goal at 10:32 of the third period on Saturday prevented the Rams from blanking the Icers in both games. Sophomore Paul Kenny stopped 33 shots in Friday's 5-0 whitewash, while freshman Andrew Marks made 29 saves in Saturday's 4-1 victory. The turning point on Saturday came in the latter stages of the 2nd period. With the Rams up 2-0, Marks stoned Nick Seravalli, Chris Pronchik and Chris Cerutti on breakaways. Marks also got some help from the goalpost late in the 3rd period as the Rams iced the game with two empty-net goals. Here's a recap of the weekend games. As you can see, we had our problems as well - with choppy video and a lack of lighting at our broadcast spot. During the first intermission of Friday's game against West Chester Joe Battista provided the details of the vote and spoke about the next steps in the process. The final minute of the first period belonged to West Chester as they netted two goals in that time span. However in the remaining 59 minutes, the Icers scored 10 and finished the weekend sweep of Golden Rams by a final score of 10-3 Saturday at the Ice Line Quad Rink in West Chester. Tim O'Brien opened the scoring just 48 seconds into the game and the Icers never looked back. O'Brien finished the game with two goals, while Junior Kevin Miller, who transferred from Robert Morris, got his first goal as an Icer. Other goals scorers for the Icers were Dominic Morrone with two, Chris Cerutti also with two, Taylor Cera, Mike McDonough, and Chris Pronchik. Cerutti, who had five goals on the weekend, was named the first star of the game. Morrone, who was perfect in faceoffs and played a tremendous two-way game was awarded second star. The third star was Freshman Matt Madrazzo, who backstopped Penn State and got his first win in an Icers' uniform. Rodney didn't mention that Matthew Madrazzo also picked up an assist on Domenic Morrone's second goal of the night. Thanks to Steve Zodtner for joining me - it's always fun when we get together to call a game. Someone in the Icers locker room needed to step up on Friday night. Chris Cerutti was that someone. The Icers once again looked lethargic through the first 40 minutes against a younger, less-experienced West Chester Golden Rams team. The teams were tied 2-2 after 2 and it got worse just a minute into the 3rd period when Tim Margadonna put the Golden Rams back on top. However, just 33 seconds later Taylor Cera knotted it up, setting the stage for Cerutti. The junior forward scored two more, including a power play tally, for his first hat trick of the season as the Icers skated to a 5-3 victory. Game two of the home-and-home series is tonight at the Ice Line in West Chester. Game time is scheduled for 7:30. In off-ice news, the Penn State Board of Trustees voted Friday to appoint Crawford Architects of Kansas City, Mo., and Bohlin Cywinski Jackson of Wilkes-Barre, Pa., as architects for the design of the new arena. Full details are on the Athletics Department website. I interviewed Joe Battista in the first intermission on Friday. I'll try to get the interview posted here after tonight's game. It should come as no surprise that the outcome of last week's series with Liberty doesn't sit well with anyone involved with the Penn State Icers. Players, coaches, fans and - yes - even broadcasters are not happy with the split. That was evident in my interviews after Tuesday's practice with both Tim O'Brien and head coach Scott Balboni. Both made no bones that this team has to play better, and the answer has to come from within. When they're good they're very, very good. When they're bad, well that's a whole different story! Focus will be important as the Icers embark on two weeks of conference play. This weekend it's a home and home series with West Chester. The home stand wraps up Friday night before the two teams meet Saturday evening at the Ice Line in West Chester. The Golden Rams are just 3 and 8 on the season, but they always find a way to bring it against the Icers, especially at home in a rink that's been a house of horrors for previous Icers teams. It won't get any easier the following week as the team heads to Rhode Island and a battle with the resurgent Rams. Rhody is 9-2-1 on the season and an impressive 7-0-1 at the Boss Arena. The Penn State Icers scored 5 unanswered goals in the third period Thursday night, overcoming a lackluster first 40 minutes as they knocked off the Liberty Flames 7-3. The teams traded a pair of goals in the first period, with Liberty's Greg Jensen getting the lone goal in the second. His score sent Ted Hume to the bench for the second consecutive game, with Dan Ivanir coming on in relief. The key to the turnaround was Paul Daley. His physical play late in the middle frame lit a fire (pun intended) under his mates and they dominated play in the third. Daley assisted on all three of Tim O'Brien's third period goals, with Kurt Collins chipping in with a pair. Defensively, the Icers held the Flames to just 4 shots in the third. Ivanir faced just six shots in recording his first win of the season. If you toss out the 11-0 laugher over Drexel, the Icers have yet to play a full sixty minutes of good hockey, which has to be of concern to the coaches. We'll see if they can accomplish that task tonight in the finale of this two game set. I put together a highlight video from Thursday's game; however, YouTube is having issues with uploads and I was unable to get it loaded. I may give it a go later. In the meantime, Michael Ivanir has some fantastic photos on his Facebook page. It's a short week for the Penn State Icers as they prepare for the Liberty Flames' visit on Thursday and Friday. The timing could have been better after the Icers managed a split with the Ohio Bobcats. OU coach Dan Morris and the Bobcats had a game plan that stymied the Icers. OU fell asleep in the third period on Friday, while the Icers' game fell apart after a strong start on Saturday. The results speak for themselves. It was the player-parent weekend, and it was great to meet the new family members and see some that aren't able to make it to all of the games. Ed Hume, father of senior goalie Ted Hume, traveled from Austin, Texas and brought along his camera. Ed was kind enough to send me the links to his online photo albums from Friday's and Saturday's contests. In addition to Ed's photos, Michael Ivanir focused his lens on the weekend action. "Muffin's" dad has his work online as well - you can see the results here. The Icers family is lucky to have such talented members. Thanks for the great work gentlemen. That's the blunt assessment of Scott Balboni after the Icers took two from the Central Oklahoma Bronchos last weekend. Certainly, the Icers have looked good during their 5-0 start to the season, but just as certainly, there have been some major mistakes that have led to opposition goals. Those mistakes are being addressed during practice this week as the Icers prepare for this weekend's series against the Ohio Bobcats. OU comes to town with a 3-2-1 record,ranked 2nd, while the Icers are 4th in Division I. Dan Morris' team split last weekend's home series with Oakland after being swept by D-I newcomer Davenport at the Bird Arena the previous weekend. (T)hese contests will mark the 77th and 78th time that they have met since the 1981-82 season. Penn State currently leads the series with 43 wins, 26 losses, 5 ties and 2 shootout losses. Last year, the Icers went 3-1 against the Bobcats. One Icer who is off to a solid start to the season is sophomore defenseman Rich O'Brien. Rich is 5th on the team in scoring with 2 goals, including a power play marker, and 3 assists. His plus-7 is tops on the team along with Kevin Miller and Mike McDonagh, and he's racked up 6 minutes in penalties. Rich is part of the first father-son duo in Icers history. Dad Rick played one season with JoeBa back in the last century, recording one assist and enough penalties that Rich may never catch that number! I'm late getting the game highlights from the Icers weekend sweep of Central Oklahoma posted because of work commitments and spending a couple of frustrating days installing new editing software on my computer. Now that I've finally got it working, I'm on the learning curve of the more robust software that replaced what I had been using in the past. Here's the results of my first efforts - and the results of the Icers' sweep of the Central Oklahoma Bronchos. The Icers are now 5-0 on the season, with the Ohio Bobcats coming to the Greenberg this weekend. The 'Cats are off to a 3-3 start, but coach Dan Morris always has his team ready to battle with the Icers in what has become one of the most heated rivalries in the ACHA. The numbers say it all. One twenty-nine. The time left in the third period of last spring's national tournament quarter-final game against the Central Oklahoma Bronchos. The time left separating the Icers from a berth in the semi-final. The time of the game-tying goal on a shot from the blue line that led to overtime and a Bronchos goal just 1:42 into the extra frame. The upstart Bronchos, in just their fifth year of existence, staged one of the biggest upsets in ACHA national tournament history just one night after upsetting in-state rival Oklahoma 5-4 in double overtime. Needless to say, the players have had this weekend circled in red on their calendars since the announcement that Central Oklahoma will make its first trip to Hockey Valley. 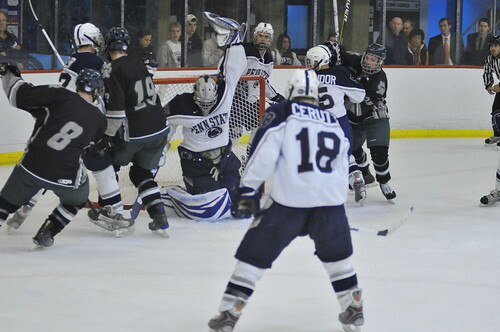 The Icers are off to a good start, with a 3-0 record after last Friday's 11-0 shellacking of Drexel in the home opener. The Bronchos stumbled out of the gate, being swept by the Sooners, Iowa State and reigning D-1 champs Lindenwood. UCO got off the schneid at last weekend's ACHA Showcase in Boardman, Ohio with wins over Slippery Rock (3-2), Buffalo (5-1) and Mercyhurst (7-2). This is a different Bronchos team, with 17 freshmen on the roster. However, head coach Craig McAlister - the man who built the UCO program from scratch - will have his team primed and ready to take on the Icers. Scott Balboni and Josh Hand will have to make sure their troops are fired up, but will have to ensure that the guys play within themselves and look at this weekend as just another series and not a chance for revenge. CORRECTION: I have been reporting that Ted Hume is tied with Scott Graham (99-03) for 3rd all-time in wins by Penn State goalies with 54 wins. In fact, Scott has 56, nine fewer than career co-leaders John Gray (89-93) and John Sixt (95-99). The Drexel Dragons were simply no match for the Penn State Icers in Friday's home opener at the Greenberg Ice Pavilion. The Icers scored five in the first, four in the second and two more in the third to cruise to an 11-0 victory. Ted Hume was relieved by Dan Ivanir midway through the game. Ted gets the victory, moving him one up on Nick Signet and into a tie with Scott Graham with 54 career victories - 3rd all-time behind John Gray and John Sixt (65 wins). Chris Pronchik scored twice while the Icers were shorthanded Tim O'Brien and George Saad had a pair of goals, while Dan Petrick recorded his first goal as an Icer and wondered what took so long. Here's all 11 goals and Rodney Martin's interview with first star George Saad. Rodman did a good job with the player interviews -- looks like we'll be able to keep him on camera. A couple of notes on last night's production. First, I was so busy during the intermissions that I neglected to update the scoreboard graphic - that's why all the goals were scored in the first period! DOH!!! Second, when the Icers hit double figures on the scoreboard, the numbers were off-center on our on-screen scoreboard. Third, no matter what setting we use on the video camera, the yellow lights at the 'Berg will always look yellow on your computer screen. Lastly, I don't feel so bad about calling Dan Ivanir by his father's name. Watching the Leafs and Senators on Hockey Night in Canada tonight and Jim Hughson (one of the best play by play guys around) called the Senators' Nick Foligno by his father's first name. Ironically, both Ivanir and Foligno fathers are named Mike. There was a surprise skater at the Icers practice on Tuesday. Big Ten Network reporter, Penn State alum and big sister Melanie Collins laced 'em up and skated with the guys. Melanie and the BTN crew are in town this week taping a segment for the Big Ten Tailgate show airing Friday night at 11 pm. Not only will the show highlight the fun on the ice, there will be an interview (I'm shocked!) with Joe Battista. Be sure to set your DVR to record the show hosted by Mike Hall. If you forget, the show will be available on the show page linked above. The Icers came away from the opening weekend of the season with a pair of less-than-perfect wins at Pittsburgh. One of the most impressive players against Pitt was freshman Mike McDonagh. The Wilmington, Mass. native had a solid two-way effort in Friday's 5-1 victory. On Saturday, Mike scored his first goal as an Icer and added an assist, gaining first star recognition. I caught up with Mike at Tuesday's practice and also spoke with Head Coach Scott Balboni about what needs to improve for Friday's home opener against Drexel. I'll have more videos posted on Wednesday. Be sure to check out some of the extra activities from Tuesday's practice session. "By the Skin of Their Teeth!" There's an old axiom in sports that "good teams find a way to win ugly." Well, I'm not sure just how good this edition of the Penn State Icers is, but on Saturday they won UGLY, hanging on for a 5-4 victory over the Pitt Panthers. The teams were tied 1-1 after the first and 2-2 after 40 minutes. The Icers twice in the third period took a 2-goal lead, but both times they allowed Pitt to score with sloppy play in the defensive zone. I gave first star honors to freshman Mike McDonagh. Mike opened the scoring with his first goal as an Icer and added an assist on George Saad's second goal of the weekend. Rich O'Brien notched his second of the season, doubling his total as an Icer, while Chris Cerutti and Marek Polidor added their first goals of the season. Ted Hume added another win, tying him with Nick Signet with 53 career victories, 4th all-time for Icers netminders. Ted is now 3 wins behind Scott Graham (1999-2003) and 12 back of career leaders John Gray (1989-93) and John Sixt (1995-99). The coaches have some work ahead of them this week getting the team ready for the Drexel Dragons. The Dragons have a nasty habit of rising to the occasion against the Icers, and with Friday's contest coming on Homecoming Weekend there will be some added distractions for this young team. Here's a look at the Icers goals and the final half-minute of action from Saturday's contest. It wasn't perfect, but a road victory to open the season is nothing to sneeze at. The Icers scored 4 unanswered goals, 2 of them on the power play, as they rolled over the Pitt Panthers 5-1 on Friday night at the Blade Runners Arena in Harmarville, PA.
Chris Pronchik scored twice, with singles going to George Saad, Carey Bell and Rich O'Brien. Ted Hume was not heavily tested, but was solid in net. The victory is Big Ted's 52nd career win, putting him just one behind Nick Signet (2005-09) for fourth all-time on the Icers' win list. He's four wins behind Scott Graham (1999-03) and he could become the Icers career wins leader by the end of his senior season. John Gray (1989-93)and John Sixt (1995-99) sit atop the list with 65 career victories. I was impressed by the play of freshman Mike McDonough and sophomore Michael Longo. Both were throwing the body around, set up some scoring opportunities and had a few of their own. Here's the Penn State goals along with post game comments from Head Coach Scott Balboni. Game two of the opening weekend for the Icers is this afternoon at 4pm EDT. We'll have the action live on our UStream channel. It looks like we are good to go for our first road trip of the season as the boys head to da 'Burgh to take on the Panthers. I've spent the past couple of days working on getting some new software installed that's going to improve our video webcasts. Rodney Martin has pitched in with his expertise - adding some features that we know you'll enjoy. I got some more good news on Wednesday. It looks like the Icers and Panthers are going to be playing both games on the main rink at the Blade Runners arena in Harmerville. That means we'll have a wifi signal and should not have any problems streaming both games. According to the arena manager, the Saturday matinee is now scheduled for 5 pm, not 4. Let's hope for a good weekend for the team and the broadcast team! The Icers open the 2010-11 season on the road this weekend, taking on the Pittsburgh Panthers on Friday and Saturday. Assistant Coach Josh Hand put the team through a grueling practice session this afternoon, working on speed and some in-close drills designed to toughen the boys up. Then, to top of their day, Josh had them skate, skate and skate some more -- so much so that the championship banners were flapping in the breeze! I caught up with Coach Hand and junior forward Chris Cerutti to talk about the season ahead. Friday's Blue - White game showed that the team needs some work heading into the 2010-11 season. That's not really a surprise, given that they've had about a week of practice time. For what it was worth, the Blues won 5-3. Chris Cerutti notched two for the Blues, Tim O'Brien responded with two for the Whites in the two-period contest. Coach Scott Balboni spoke with me after the first period and was concerned about the sloppy defensive play from both squads. I felt that there's some work needed on offense as well. Obviously, the coaches have had little or no time to work on special teams play, but there weren't any penalties called so that was a moot point. The Icers open the season on the road next Friday night against Pittsburgh. We'll have the game from the Blade Runners arena in Harmerville live on UStream. We could have an issue with webcasting the Saturday matinee. The game will be played in the secondary rink at Blade Runners, where there is no wifi signal. Hopefully, I can get a cell signal in the rink so that we can bring you the action. Now, on to the "bonus" part of this entry. If you were at the game Friday night, you might have noticed a sweet new Shelby Mustang in the parking lot. I recognized the car immediately as the one that was being raffled by the Penn State Coaches vs. Cancer. Meet Scott and Sandy Balboni's new ride! As Rod Stewart once put it, "Some guys have all the luck!" Not only is Joe Battista the face of Penn State hockey, he's quickly become the voice of the future of the Nittany Lions hockey program in the week since the "worst kept secret in college sports" became official. Joe is doing radio interviews all around the state, including with my old friend and colleague Matt Leon at KYW Radio in Philadelphia. The players are gearing up for the 2010-11 season, and so am I. The annual Blue - White game is this Friday, one week before the Icers open the regular season on the road at Pittsburgh. Head Coach Scott Balboni announced the team captains on Monday. Marek Polidor is the captain, with Tim O'Brien, Paul Daley and Eric Steinour serving as assistant captains. Balboni told The Collegian's Anthony Barton that "what he saw in Polidor was an intelligent player, who with leading by example, was the best choice." No argument here. We'll have the Blue - White game on UStream at 9:00pm Eastern time. If you are not going to be in front of your computer on Friday night, you can now watch the game on your smartphone. You can download a UStream app for iPhone or Android phones. Isn't technology wonderful?